Arcturus - ZineWiki - the history and culture of zines, independent media and the small press. 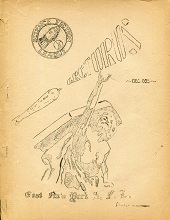 Arcturus was a science fiction fanzine published in Brooklyn, New York, U.S.A. by Harold W. Kirshenblit, as the official organ of the East New York Science Fiction League. Arcturus ran for eight issues from December 1935 to April 1938. The first five issues were numbered 1.1 to 1.5, then Kirshenblit skipped two numbers and published 1.8 and 2.1. The final issue, 3.1, was edited by Frederik Pohl and was released as an incomplete issue. Irving L. Kosow was the Associate Editor and R. Henry Drucker was the art editor. Contributions included "London News Reel" by Edward J. Carnell (Novae Terrae) and "The Sorrowful Saga" by Irving Kosow. Contributions of art work came from David A. Kyle, who drew the cover for issue 8. Frederik Pohl was also one of the co-editors of The International Observer of Science and Science Fiction. This page was last modified on 13 July 2012, at 22:52.